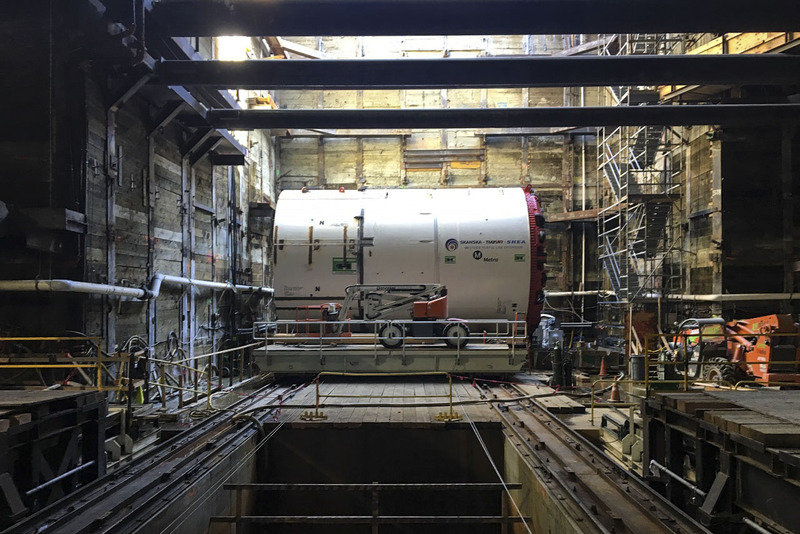 Part of the tunneling machine’s shaft being lowered into Wilshire/La Brea Station. Photos: LA Metro. View of the tunneling machine sitting on the car cradle looking north. Aligning the tail shield and middle shield. Lowering the tail shield into the station shaft. 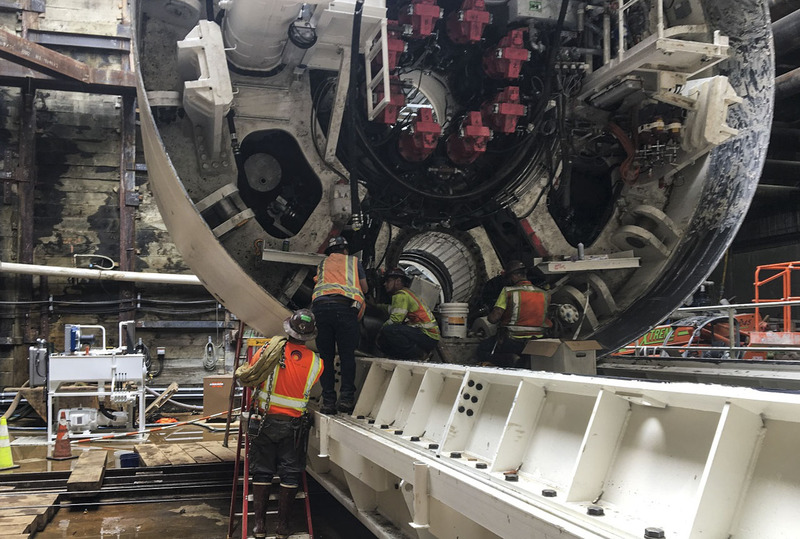 Working the tunneling machine’s front shield. 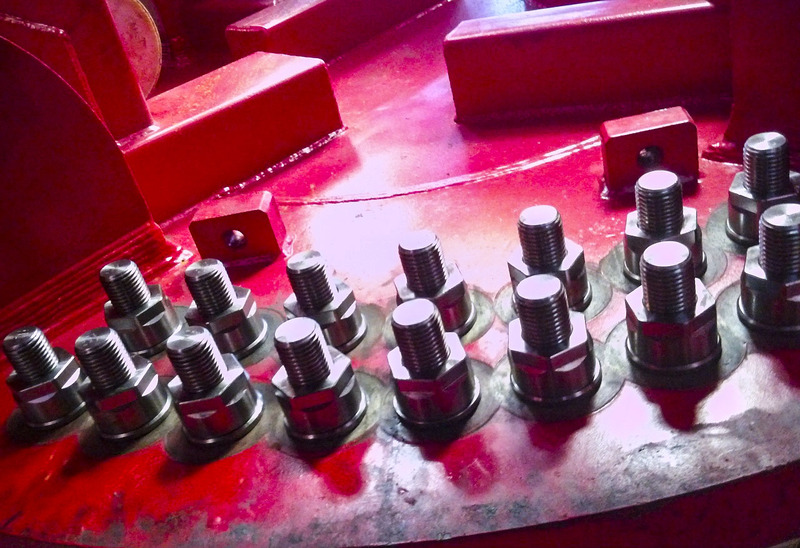 Tunneling machine cutterhead’s main bearing bolts. 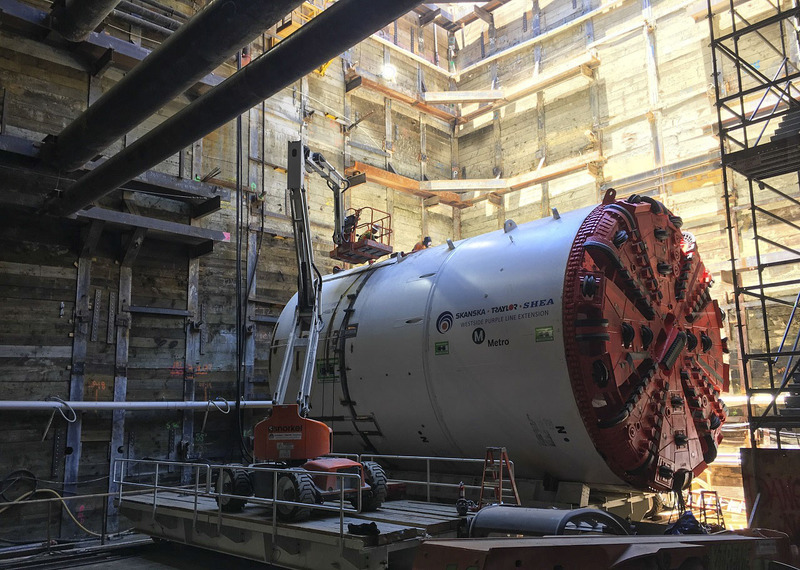 The Purple Line Extension’s first section is under construction with the subway being extended for 3.9 miles from Wilshire/Western to new stations at Wilshire/La Brea, Wilshire/Fairfax and Wilshire/La Cienega. 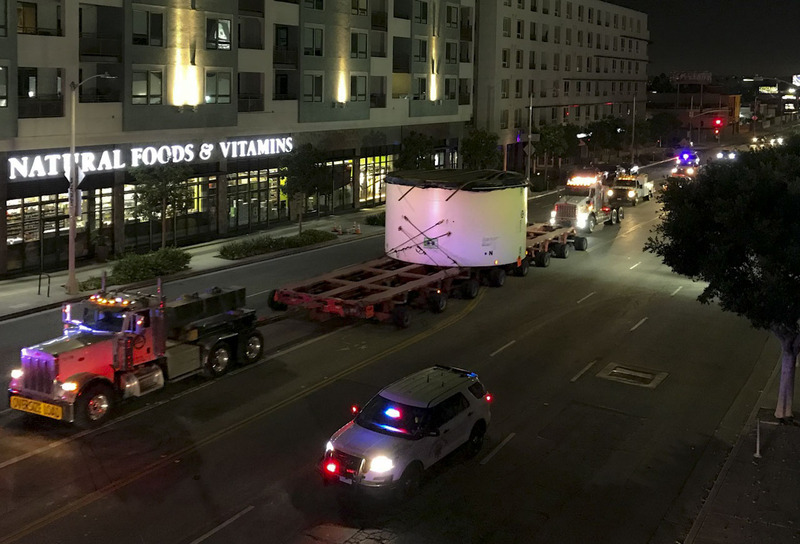 The first of the project’s two tunnel boring machine (TBMs in construction-speak) arrived at the construction site earlier this month and is now being lowered into the Wilshire/La Brea Station. 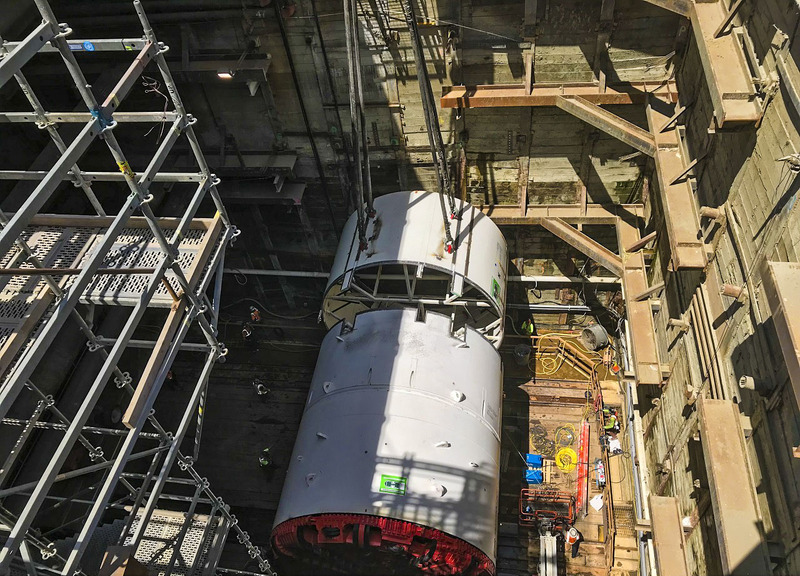 Once both TBMs are lowered into the station and fully assembled, they’ll start to dig later this year with both TBMs headed east toward Wilshire/Western. 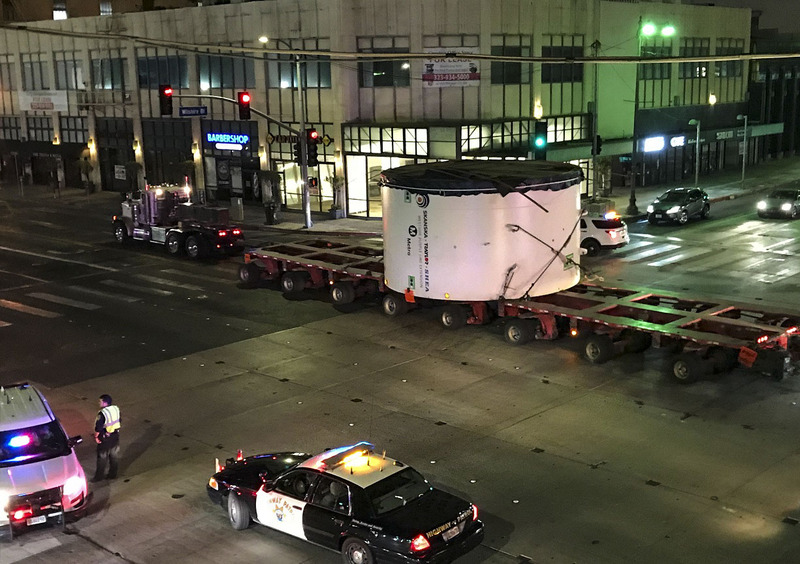 Once there, the TBMs will be disassembled and taken back to Wilshire/La Brea and then reassembled. Digging then will resume to the west toward Fairfax and La Cienega. The Purple Line Extension is a nine-mile extension of the subway from Wilshire/Western to the Westwood/VA Hospital. The project is being built in three sections. 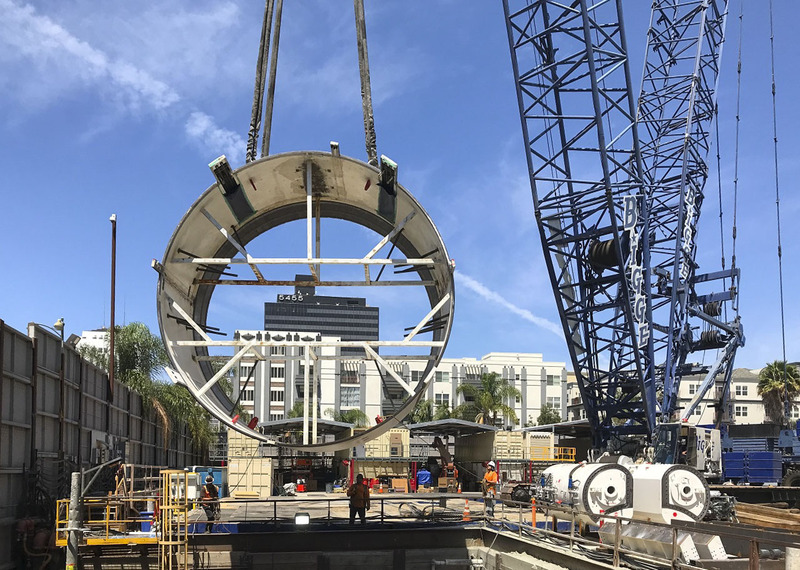 The second section — which broke ground earlier this year — will extend the subway to downtown Beverly Hills and Century City. Utility work is underway on the third section that will run from Century City to Wilshire/Westwood and then the Westwood VA Hospital, just west of the 405 freeway. The project has funding from Measure R, Measure M and from federal grants. The first section is targeted to open in late 2023. Will the tunneling between the La Brea and Western Avenue stations in any way impact surface vehicular traffic at any time? You are all so focused on “future” rail projects, that you are failing miserably to keep the CURRENT lines running smoothly. So much so, in fact, that riding your metro lines has gone from convenient to unbearable in just a matter of a few years. Constant delays! I cannot tell you how many times I’ve been stranded on a platform for 30 minutes at a time, wondering – are the trains even running today? Metro NextTrip App shows “No current predicted arrival time.” Great. Two weeks ago, that happened to me on the purple AND expo line, two days in a row! No notice on your website or Twitter page. This past weekend, the purple line was running limited stops, only between Wilshire/Western and Wilshire/Vermont. Again, no information about this posted whatsoever on your website, and no signs anywhere at the Wilshire/Vermont station clarifying what platform to use for which train. It was mass confusion, even to us veterans who have ridden the system many times before. In my decade of living in LA, I cannot recall any time in the past when Metro service has been this bad. It’s an all-time low, and showing no signs of improvement. Not only are trains unreliable, they are unsafe. Don’t even get me started with how many times I’ve been approached by crazy & violent individuals. I agree, although NYC is bad now. My main question: What is Metro working on after 8pm and on weekends? Mid day service should NEVER say 23 minutes. And seriously, what is up with the app and the lack of arrival times? I sent a tweet to Metro who responded within a minute that I should email the web master, this was also two weeks ago and I have not gotten a reply from the webmaster. Thats trash. I really really want to know what is being worked on during these maintenance hours? I’ve lived in Central City for over ten years now and this is ALWAYS THE CASE MORE THAN NOT; Purple Line Shuttle to Wilshire Vermont, than a silly transfer. Either way, it results in sometimes a 30 minute wait to get to DTLA. WE NEED TO KNOW WHAT IS BEING DONE. THE SYSTEM IS OURS; IT IS PUBLIC. Why the heck are you making people wait 20 minutes on weekends? My cynical side told me Metro is in bed with Lyft and Uber, and would prefer to diffuse its system and put people in cars during non peak periods (I’m thinking like a planner, and not someone thats ever rode the system). I read a line earlier this year that “Metro is about mobility..” as in all modes of transportation. Problem now is, in Los Angeles, you can only get to your destination quickly and when you want to if you’re willing to pay a premium. I remember 10 minute service on Subways until closing, and I could almost always catch a bus on Wilshire in less than 15 minutes from about 6am to 10pm. Our system turns into a pumpkin at 8 oclock. Everyday feels like a Sunday now except rush hour when we obviously have to ride and arent really on because we WANT to be. Fire Phil Washington. He knows nothing about Los Angeles. He is a wooden board who just looks at data and fakes like he is an actual people person. Phil is a military man, so he feels “Its the tough choices” he’s got to make, but its screwing riders. Yea, stuff is getting built, but guess what, that was mostly in motion before he got here. I really supported him at first too. I thought we had a lot in common and was inspiring, but i’ve been burned by his decisions a lot. The current management of what we have is total crap. I will never vote for another measure or initiative metro puts forward. Our bus service reminds me of what it was like when I was a kid. a 232 put black smoke in my face last week and it was 25 minutes late. Voters were warned, previously on this blog, that if they approved Measure M–the forever transit tax–they would lose ultimate control of METRO and they have. It’s no safer putting METRO on autopilot than it is putting a TESLA on autopilot–you still must keep your hands on the wheel! If I could, I would take my vote back and vote against Measure M. It is a complete waste of money.